Logging trailers from BWS available now through Maxim Truck & Trailer. BWS Trailers are "EZ-2-LOAD" so you don't have to work any harder than necessary. These logging trailers are available in various lengths and with specs to suit your particular needs. 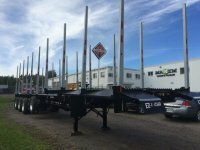 We have logging trailers in stock, and help you with any custom order as well. Offered out of our Thunder Bay location, get in contact with a Maxim account manager to order a logging trailer today.